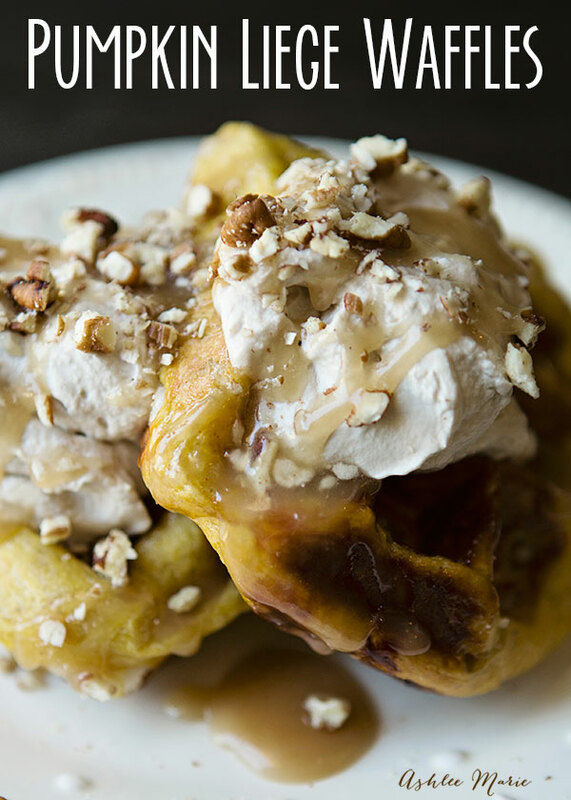 Kay it doesn’t get much more delicious than liege waffles, but add some pumpkin, maple whipped cream, toasted pecans and caramel sauce and you have the most perfect fall food ever. 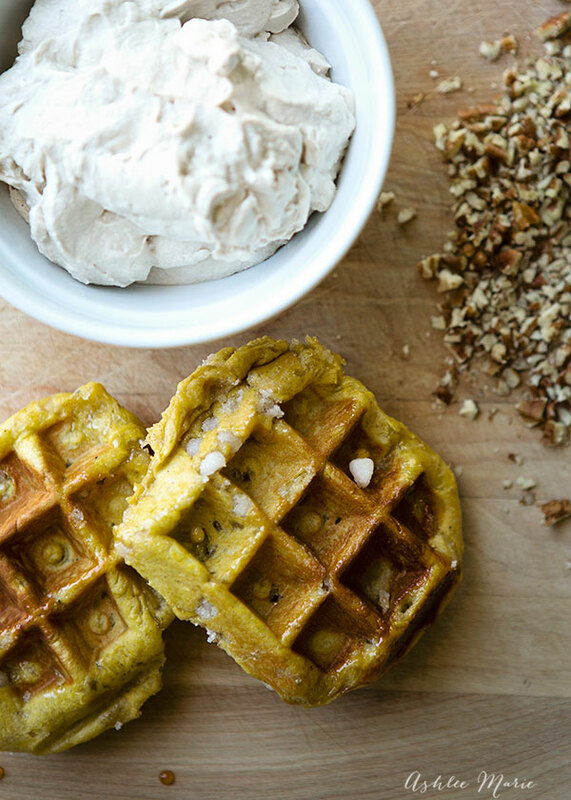 Seriously these waffles are not for breakfast… although I pretty much eat them for every meal possible! Like all traditional liege waffles these aren’t hard, but they are time consuming, to get the right yeast flavor you want to start these the day before you plan on eating them. Personally I think that’s the best part, I do a ton of work the day BEFORE I have company, then when I have guests I don’t have much to do other than enjoy them! As you can see they aren’t as difficult as you’d think – just time consuming. And kneading in the sugar crystals takes some muscles, but it’s totally worth it, if I have some crystals that just don’t want to knead in I usually wait until I’ve cut the 13 dough balls and then just press the extra crystals into any bare spot I see! Place yeast, sugar and milk into your mixer and let sit for 5-10 mins to proof. Add the egg and mix, then add the 1 1/2 C measurement of the flour. Mix to blend. Add brown sugar, salt, pumpkin and pumpkin spice and blend on low to medium-low speed. While the mixer is running on low add the honey and vanilla. The dough will start to ball-up on the paddle. If not let the dough rest for 1 more minute and mix for another 2 minutes. Cover again and let rise, at room temperature, for 4 hours. Then knock the dough down. wrap it in plastic, weigh it down a bit (I put it in a bowl with another heavy glass bowl on top) and refrigerate overnight. Roll each chunk into an ball and let it rise for 90 minutes. 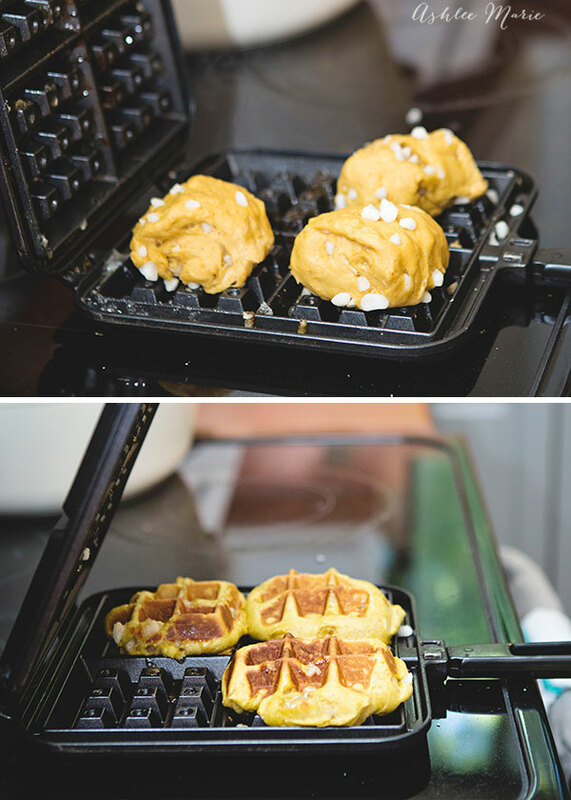 Give each waffle a few minutes to cool slightly before eating. that sugar melted on the outside is HOT!!!! I serve mine with fresh maple whipped cream, chopped pecans and caramel sauce, but they are wonderful plain too. 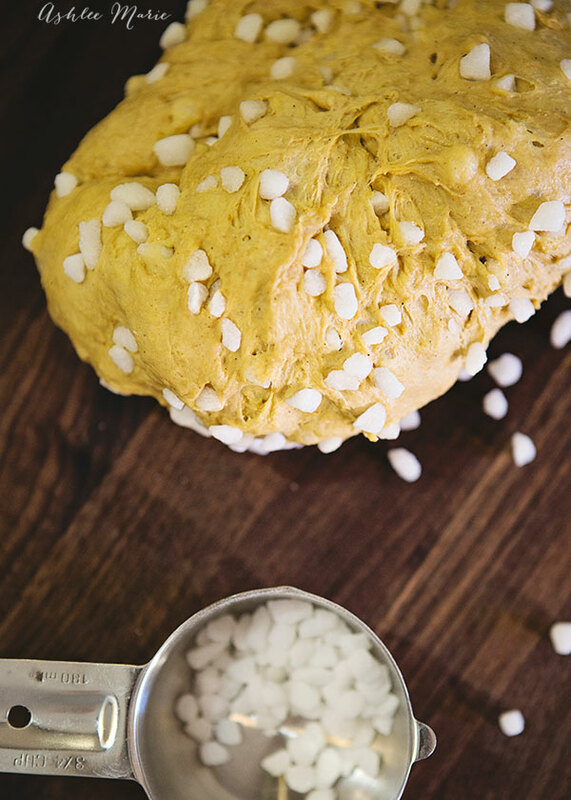 Unused dough balls can be wrapped in plastic wrap and kept in the freezer for 4 months! 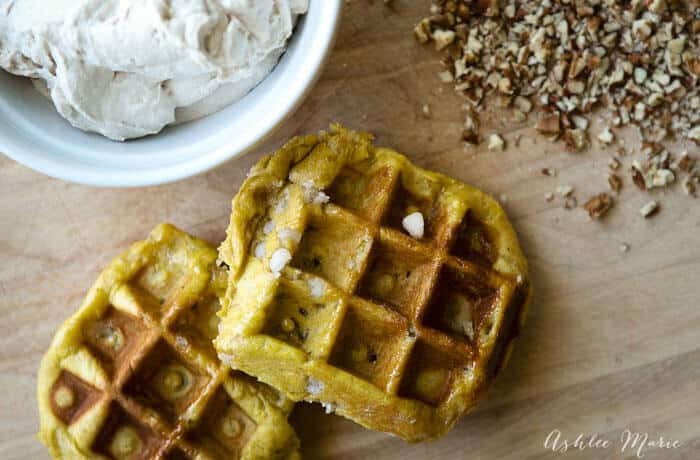 You can also get a great fall flavor by rolling the warm waffles in cinnamon and sugar (then adding everything else, HA). These are going to be a sweet treat for my dad over the holidays. I’m always looking for more ways to use pumpkin, since I always seem to have half a can in the fridge during the fall. These are perfect. Don’t forget the dough balls freeze great! I tend to make a double batch and serve company, BUT I like to put aside a few balls for myself later. That way if I have a serious craving I can pull one out and make myself a sweet treat!